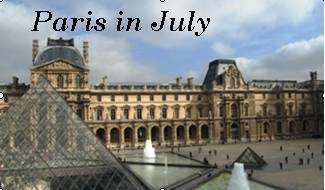 I am wicked excited to take part in the Paris in July challenge, hosted by fantastic bloggers Thyme for Tea and BookBath! Please jump onto their fabulous sites to follow along as they are the experienced Parisian fans who have actually been to Paris! Yes, I'm sidetracking a tad from my goal to read books set in Florida to prep for my upcoming vacation to Key West, but it's Paris, for cryin' out loud! PARIS! I can pretend that I'm in Paris for a bit, right?! And, I think you'll see at the end of this post, that I can sort of combine Paris and Key West. Sort of...! I grew up overseas in Greece, Philippines, and Venezuela, and have visited Rome twice (once as a kid, and again last year for my honeymoon), but I've never been to Paris -- but I would love to! I love the idea of this goal for July simply because who doesn't like some form of French culture? Whether it's the food, the films, the novels, the poetry, the architecture and design of Parisian homes, buildings...ahhh, il en sera ainsi beacoup de plaisir... Okay, I have NO idea if the Google translate feature worked effectively to translate my English of "it will be so much fun!" But, you get the gist of it! This sounds interesting! I read "Lunch in Paris" not too long ago. Hi, SogniSorrisi! Is it the one by Elizabeth Bard, the one with the recipes? If so, I just took a quick look at it, and it looks great! If that's not it, let me know, anything Paris is fun, right?! Oh, Bellezza, here's a sneak peek on A Moveable Feast -- I cannot put it down!! Welcome to Paris in July... I think you'll have fun with this, and do two challenges at once - Thanks to Hemingway! 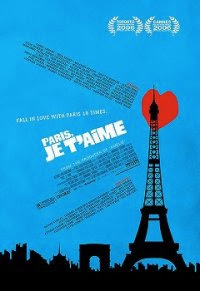 We went to see paris Je t'aime as a French class only 2 years ago. It was a great collection of short stories. As adults learning french we just loved the last story! Thanks, Tamara! I am looking forward to this and am eagerly looking at all the options to celebrate Parisian life! Thanks to you and BookBath for creating the challenge as well!